North America’s Hognose Snakes are well-known for their impressive defensive displays. I’ve found the Eastern Hognose in its natural habitat and have bred it for a release program during my tenure at the Bronx Zoo. But as this snake limits its diet to toads, it is rarely seen in zoos or private collections. The Western Hognose Snake (Heterodon nasicus), on the other hand, has gained a following among snake-keepers that is usually reserved for rat snakes, boas, and pythons. It seems to be the most popular of the “non-typical” snakes kept, at least here in the USA. Reasons for this abound, including a “viper-like” appearance, dramatic defensive display, calm demeanor, non-demanding diet, and willingness to reproduce. Selective breeders have been thrilled with this species as well – as evidenced by the astonishing 52 “designer color morphs” that have been produced! I’ve also had the good fortune to work with the very impressive Madagascan Giant Hognose Snake (Leioheterodon madagascariensis); please see the article linked below for further information. 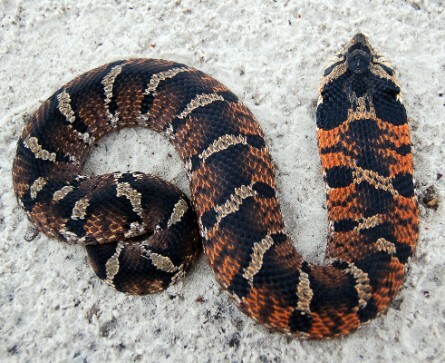 Two snakes formerly considered to be subspecies of the Western Hognose Snake have now been described as full species – the Dusky Hognose (H. gloydi) and the Mexican Hognose (H. kennerlyi). Also included in the genus are the Eastern Hognose Snake and the Southern Hognose (H. platyrhinos, and H. simus, see photos). 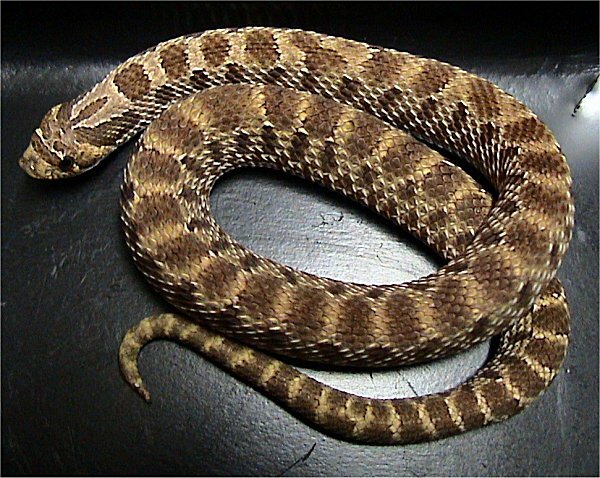 The Western Hognose Snake is heavily-built, yellowish-tan, gray, or dark brown in color, and marked with black blotches. Upturned rostral scales on the snout assist it in burrowing and unearthing prey. Adults average 2 feet in length, but appear larger due to the thickness of their bodies; the published record size is 35 ¼ inches. I was surprised to find that the number of color morphs available now rivals those established for those two pet trade heavyweights, the Ball Python and Corn Snake. At least 52 color and pattern variations, with fanciful names such as Albino Super Anaconda, Coral, and Pistachio, are now being offered. You can see photos of many at the site linked below. Uploaded to Wikipedia Commons by Dustin M. Ramsey. The Western Hognose Snake’s range extends from southeastern Alberta to northwestern Manitoba, Canada, and south to southeastern Arizona, Texas and northern Mexico; isolated populations may be found in Minnesota, Iowa, Illinois and Missouri. Largely terrestrial and often sheltering below ground, the Western Hognose favors open habitats such as sandy or sand/gravel prairies, thorn scrub, and lightly wooded grasslands, and has been found to elevations of 8,000 feet above sea level. Western Hognose Snakes are rear-fanged, and produce mild venom that is used to overcome their prey. They are not considered to be dangerous to people, but the consequences of allergic reactions or of a bite to a child, senior citizen or immune-compromised individual should be considered. Consult your doctor before acquiring any rear-fanged snake. When cornered, the Western Hognose Snake flattens the body and hisses loudly, after which it strikes, usually with a closed mouth. When pressed further, it may roll over and feign death. Captives soon give up this charade, which in any case is rarely as dramatic as that put on the Eastern Hognose. Many people see a close resemblance between this snake and the several rattlesnake species that share its range. As you can see from the photo, a similar appearance and display is seen in other Viperids as well, such as Africa’s Puff Adder. Youngsters may be accommodated in 10 gallon aquariums. Average-sized adults can be kept in a 20 gallon long-style aquarium, with a 30 gallon being preferable for extra-large individuals or pairs. The tank’s screen lid must be secured by cage clips, as they are very powerful, even by snake standards. Natural burrowers, Western Hognose Snakes are most comfortable below-ground. A deep layer of cypress mulch or aspen is preferable to newspapers as a substrate. I’ve kept Eastern Hognose Snakes on a sand/gravel mix, but the possibility of impactions has been raised by some keepers; please post below for further information. Native to arid environments, Western Hognose Snakes do not fare well in damp enclosures. Western Hognose Snakes do well at a temperature gradient of 75-82 F. An incandescent bulb or sub-tank heat pad should be used to create a basking spot of 90 F.
A ceramic heater, heat pad, or red/black reptile night bulb can be employed to provide heat after dark. Not nearly as picky as its east coast cousin, the Western Hognose takes toads, lizards, other snakes, rodents and the eggs of turtles, lizards, and birds with equal gusto. ; locusts and other large invertebrates have also been reported as food items. I recall one study in which this species was identified as the major nest predator of an endangered turtle (the details escape me right now). Captive adults readily accept mice, but hatchlings prefer lizard or toad-scented pink mice at first (some keepers report that water from canned tuna also works well). In time, they can be weaned onto unscented mice. In their natural habitat, Western Hognose Snakes breed from March-May, and females deposit 4-25 eggs approximately 3 months later. The 6-7.5 inch long youngsters hatch in 7-9 weeks, and are sexually mature at 2-3 years of age. The published longevity for this species is just short of 20 years. Pets are not so closely tied to the seasons as are wild individuals. Please post below for detailed information on captive breeding.